Everything we have used from Memoria Press has been a great addition to our homeschool. I recently received The Story of the Thirteen Colonies & The Great Republic Set as well as 200 Questions About American History Set from them to use. When our package arrived in the mail my adult daughter and her friend were here for a visit. I was anxious to open the box and get a good look at the products even though I knew it would be two more days before we would get started using it. We are a trivia and game loving family so the kids immediately wanted to open the American History Flashcards. I started reading them from the top of the pile and my kids were having a blast answering the questions & hearing the answers to the ones they did not know. When we were about 3/4 of the way through the pile my daughter's friend who attended public school and is a college graduate said we made her feel stupid because she didn't know any of the answers and she wanted to know if she could study American History while she was visiting. The Story of the Thirteen Colonies & The Great Republic uses the text written by H.S. 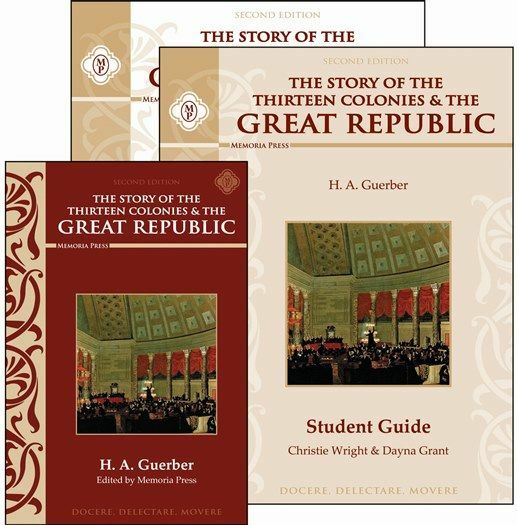 Guerber and edited by Memoria Press and comes with a softcover Student Guide, and a Teacher Guide. The 211-page text was originally written in two volumes at the turn of the 20th Century. Memoria Press thinks they are the best quality text for the middle school students, so they combined the two volumes into one. It is divided into 85 short chapters with only one or two pages in each. The 104 page Student Guide is divided into 32 Lessons and has an extensive Appendix. Each lesson is set up the same way and include Facts To Know, Vocabulary, Comprehension Questions, and an Enrichment section. The Appendix includes maps, charts, song lyrics, the Constitution with the Amendments, the Emancipation Proclamation, and more. The Teacher Guide is set up exactly like the Student Guide but also includes the answers as well as the student tests and their answers. 200 Questions About American History comes with 200 question flashcards, a softcover Teacher Guide and Student Book. It is a great accompaniment to any good American History course. 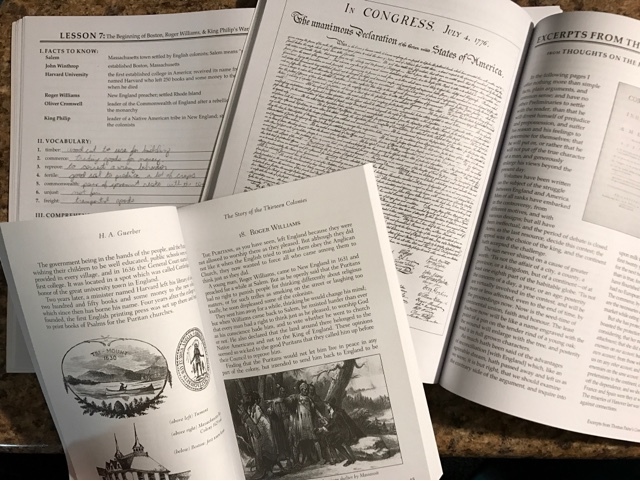 The Recommended Texts & Weekly Schedule included in the student book has the course being completed in 34 weeks using The Story of the Thirteen Colonies & The Great Republic and Story of the World, Volume 4 by Susan Wise Bauer together. The Student Book has drill questions from the text, a timeline of events where the student should fill in the date, questions about notable quotes, and the presidents. The answers are included in the Teachers Guide along with the tests and answer keys. Alaina has been using both The Thirteen Colonies & The Great Republic Set and 200 Questions About American History Set. We have always studied history together, so I read the text out loud to her and we talked about what I just read. Then she would work on the vocabulary and questions in her workbook. Some days we would use the Comprehension questions more as a discussion and then she would spend more time writing her composition. When we used the 200 Questions flashcards I would add in the new ones and we would go through them all. Even my high school girls thought it was fun to see who could answer the most. Not only are both of these sets a great for a middle school classical education it would also be helpful to people who are older that don't have a knowledge of American History.